It’s the heart of summer and I celebrate its juiciness. Wild berries including thimbleberries, red huckleberries, blackberries and salal are abundant in fields, forests and back alleys. People are heading to higher elevations to pick prized mountain huckleberry. It’s the perfect time to gather berry leaves for tea. Harvesting and preserving this bounty ensures that even in the cold days of winter we can relish the flavors and smells of the summer sun. Berry picking is also a time to gather with friends and family, and to be nurtured by the gifts of the land. Wild berries are some of the healthiest foods available. They are packed with nutrients including vitamin C, vitamin E, fiber and riboflavin. Berries are high in flavenoids called anthocyanidins, which are responsible for giving them their color. Flavenoids in berries have antioxidant powers that protect the body from Alzheimer’s, cataracts, glaucoma and the side effects of diabetes including diabetic retinopathy, kidney damage and vascular degeneration. Berry leaves are also packed with nutrients including minerals and antioxidants. What is better than wandering through the woods and finding a bush covered in ripe huckleberries? In the Northwest, there are more than 12 species of huckleberries, which range from the coast to the high mountains. Huckleberries come in many sizes. Dwarf wartelberry is a mere six inches tall and is covered in tiny red berries that would satisfy a mouse, while the bigger mountain blueberries and huckleberries are large enough for a bear to gorge on and actually get full. Berry colors range from orange-red to purple to deep blue-black. Blueberries are a very close relative to huckleberries and they share many of the same characteristics. Blueberries and huckleberries do not raise blood sugar and are an important food for pre-diabetics and diabetics. They are high in antioxidants, which help protect the body from the effects of high blood sugar including diabetic retinopathies, kidney damage and poor tissue healing. Recent research suggests that blueberries (and huckleberries) also lower cholesterol and help to prevent heart disease, cancer and bladder or urinary tract infections. They are strengthening our heart and blood vessels. One of the easiest ways to make berries a regular part of your diet is by freezing them. You can add them to hot cereal, sprinkle them on cold cereal, or put them in smoothies. The recommended daily amount for health benefits is 1/2 cup a day. Salal is one of our most common and most overlooked berries. It grows in lush thickets under open evergreen forests or in sunny areas where there is moisture and good drainage. The leaves are thick, dark green on top and noticeably waxy. Spring flowers look like little white bells and the berries are a blue-black when ripe. Berries are ready between July and September, depending on elevation and weather conditions. They vary from delicious to bland and boring, depending on soil and sun conditions. Always taste the berries before you gather them, and if they do not suit you, try traveling to a different bush a little ways away. Salal is an important food for Native People. The berries are traditionally mashed, dried into cakes and then stored and eaten in the winter months. They may be mixed with nuts and dried fish or meat to make a native power bar. In addition to having vitamins and minerals, salal also contains protein and good quality fats. Just a little handful can give you enduring energy. Bright red thimbleberries are a summer delicacy. The seeds are tiny and have a little crunch that is pleasing to the senses. 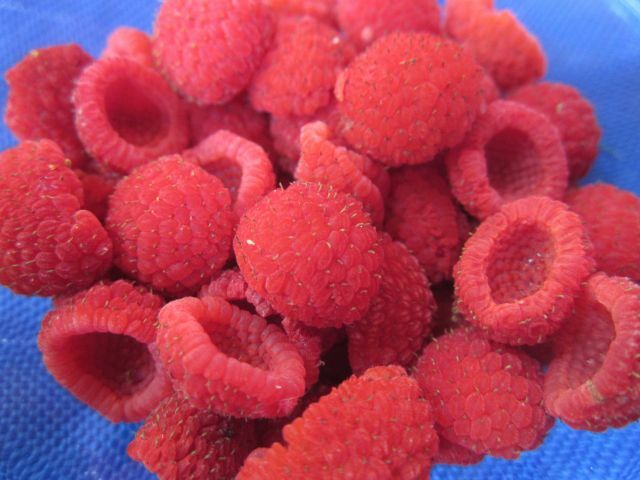 The berries are delicious fresh, and because they are seedy and less water-laden, they dry well as fruit leather. Large soft maple-like leaves give this plant another common name: “toilet paper plant.” Thimbleberry flowers are large and white, resembling a wild rose. Thimbleberry is a special herb for women’s health. The astringent qualities of the leaves helps tone the uterus in a similar way to raspberry leaf. Wild blackberries are low-growing plants with long-running silvery-grey stems that act like trip wires in the woods. They create a ground cover in woods or in clearings. Male and female blackberry flowers grow on different plants. They are white with five long petals. Only the female plants produce the juicy delicious berries. Sometimes you will see a whole area covered by healthy looking blackberry runners and not a single berry. This is probably a male plant. Most coastal Native People prize wild blackberries as a mid-summer treat. They are high in vitamin C and natural sugars. Blackberry leaf is an astringent medicine, and can be made into a pleasant, rose-tasting tea. It has traditionally been used for stomachaches, burns, wounds, diarrhea and sore throats. Gather the leaves in spring through winter and dry in paper bags or hang on hooks in a warm place with good airflow. Use one small handful per cup and drink several cups a day. Gather berries in late summer to early fall when they are sweet and tasty. Clean and rinse if necessary. Three quarts of berries makes about one cookie sheet of fruit leather. Place berries in a blender with about 1/3 cup honey to sweeten and the juice of one fresh lemon to bring out the flavor. Fit parchment paper over a cookie sheet with sides. Pour blended berries onto the sheet and use a spatula to smooth them out to an even consistency of about a quarter inch. The berries can be dried traditionally in the sun or in the oven. Sun drying: If it is hot and dry, place the pan in the full sun, preferably in a windy spot. If there are flies or bugs, you can put cheesecloth over the berries. It will probably take 2-4 days to dry completely, so bring the berries in at night to prevent them from gathering dew. After the berries are mostly dried, lay another piece of parchment paper over the berries and carefully turn them over. Peel the old paper off and let the other side dry out. When it seems the consistency of fruit leather, cut the berry sheet into strips and store in plastic bags to prevent it from drying out completely. Oven method: Place the berries in the oven on the lowest temperature (usually about 170 degrees) and leave the oven cracked so that water can evaporate off the berries. When the berries are mostly dry (6-8 hours) place another piece of parchment paper over the berries and flip them over. Carefully peel off the wax paper and continue drying. If you have to leave, simply turn your oven off and place the berries in a warm spot in the house with cheesecloth or a paper towel over them. Continue drying as you can. Variations: You can make fruit leather out of a variety of berries. The key is to use berries that are low in water content. Good choices are thimbleberry, blueberry and huckleberry. Put all ingredients in a jar with a lid and shake vigorously. Use as a salad dressing or dipping sauce for bread. Huckleberry helps to lower blood sugar. Many of these herbs are high in vitamin C and antioxidants that help strengthen tissue in the heart, kidneys and blood vessels. Steep this tea about 15 minutes. Drink 2-3 cups a day, either hot or iced. You can mix the cold tea with juice or even fizzy water to make a refreshing summer drink. Other dried berry leaves can be substituted including, salmonberry, thimbleberry and salal. Enjoy!